Prices shown are in € (Euro), per person per night including taxes, our half-board and Bismarck included amenities. A local tax in the amount of € 2.40 per person per night is charged separately. Our holiday package and summer holiday deals are subject to our booking conditions. All information is subject to price changes and typos. You will receive a 6-days-cable-railway ticket free of charge - if you stay minimum 7 nights. Not possible in combination with other specials. 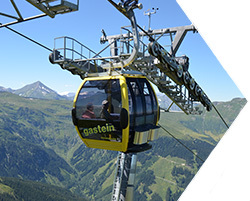 Reach the top of Gastein’s mountains in comfort with only one ticket. No matter if Schlossalm, Stubnerkogel or Fulseck - each mountain has its own charm and let your hike become an experience.